1. 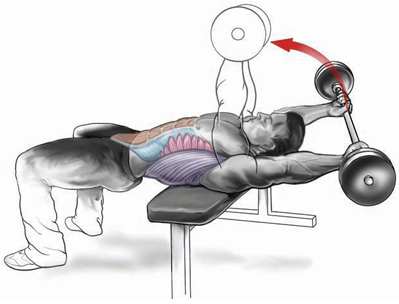 Hook your feet under the pad and sit on the decline bench with your torso upright. 2. Lower your torso backward until it is almost parallel to the floor. 3. Return to the upright position by bending at the waist. Hand position: You may hold your hands together behind your lower back, cross them in front of your chest, or interlock them behind your head. As your hands shift position from your lower back to your chest to your head, the relative resistance increases. Foot position: Secure your feet under a roller pad or comparable support. Body position: Bend your knees to reduce stress on the lower back. Range of motion: Your torso should be vertically upright in the sitting position, with your abdomen almost touching the thighs. Lower your torso backward until it is almost parallel to the floor, about three-quarters of the way down. Do not lean back too far, because when tension is released from the abdominals, stress is placed on the lower back. Trajectory: Tilting the bench at a steeper angle makes the exercise more difficult. 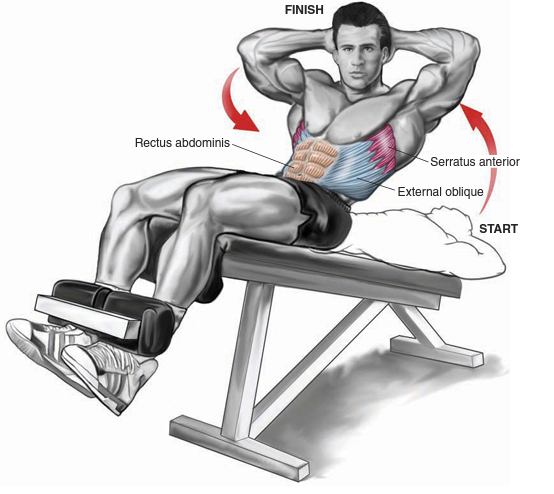 Resistance: Add resistance by tilting the bench at a steeper angle or holding a weight plate on your chest. Floor Sit-Up You can perform this exercise while seated on the fl oor with your knees bent and your feet secured on the floor. 1.Lie flat on the floor, hips bent at 90 degrees, with hands behind your head. 2.Raise your shoulders off the floor, crunching your chest forward, keeping your lower back in contact with the floor. 3.Lower your shoulders back to the star tposition. Hand position: You may position your hands at your sides or across your chest, or you may interlockthembehindyourhead.Asyourhands shiftpositionfromyoursidestoyourchesttoyourhead,theresistance increases. Body position: Your thighsshouldbebentatanangleof90degreestoyour torso.Yourlowerlegsmaybesupportedontopofaflatbench,oryour feetcanbepositionedonthefloorclosetoyourbuttocks. Range of motion: The crunch motion occurs in the upper spine, and your shoulders rise a few in chesoff the floor.Your lower back remains in contact with the floor, and there is no motion at the hips. This is in contrast to the sit-up, where the movement occurs at the waist and hips. Resistance: You can increase the degree of difficulty by placing your hands behind your head or by elevating your legs on a bench. Reverse crunch: See description of Reverse Crunch. 1. 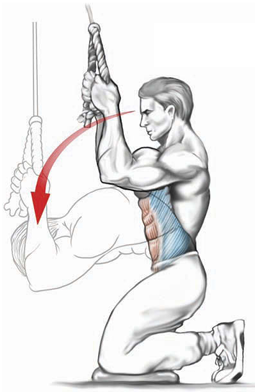 Kneel on the fl oor beneath a high pulley, and grab the rope attachment with both hands behind your head. 2. Crunch the weight downward, curling your torso and bending at the waist. 3. Return to the start position. Hand position: Your hands may hold the rope above your head, on either side of your head, or in front of your upper chest. The higher your hands are held, the greater the diffi culty. Body position: You may perform this exercise while facing toward or away from the weight stack, depending on personal preference. Range of motion: Your torso should move from the upright position to almost parallel with the fl oor. Trajectory: If you position yourself a short distance away from the pulley, you will benefi t from a greater range of motion when you crunch. 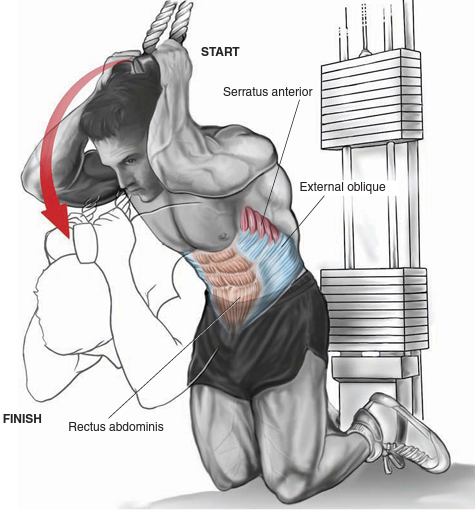 Resistance: Alter resistance by adjusting the weight stack. Facing pulley Machine rope crunch: A variety of machines replicate the rope crunch, where your back is supported while you sit or stand to perform the exercise. 1. Sit in the seat, grasp the handles, and place your feet under the ankle pads. 2. Crunch down, curling your torso toward your knees. 3. Return to the upright position. Hand position: Depending on the machine’s design, your hands grasp handles alongside your head, or your hands simply rest on the chest pad. Foot position: Feet may be positioned on the fl oor or hooked under ankle pads, depending on the machine’s design. 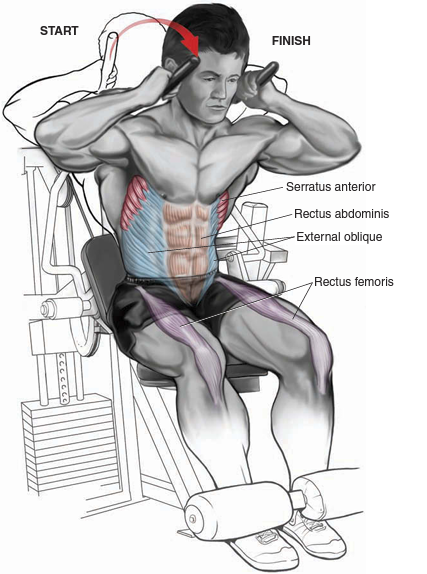 Body position: On some machines the handles provide resistance, while on other machines resistance is transmitted via a chest pad. Resistance: Depending on the machine’s design, you move the weight by holding on to handles or moving a chest pad. Adjust the weight stack to vary the resistance. 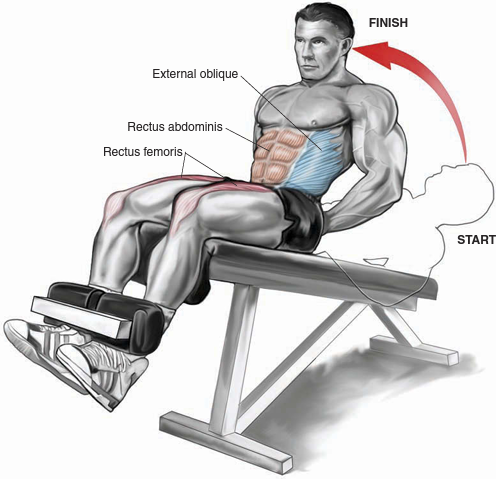 Machine Crunch With Chest Pad On some abdominal machines, the resistance is provided by way of a chest pad. 1. 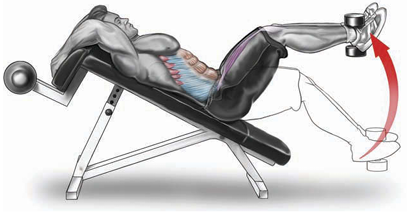 Lie supine on an inclined abdominal bench with your legs down. 2. Raise your legs at the hips and pull your thighs toward your chest, keeping your knees slightly bent. 3. Slowly lower your legs back down to the start position. Secondary: Obliques, hip fl exors (iliopsoas, rectus femoris). Hand position: Your hands function to stabilize your torso by grasping the bench or handles above your head. Foot position: Keep your feet together, knees slightly bent. 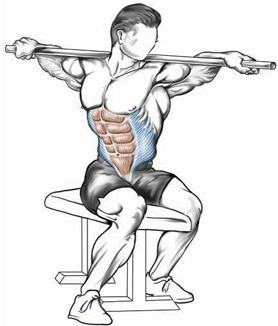 Body position: Your upper torso should remain in contact with the bench. 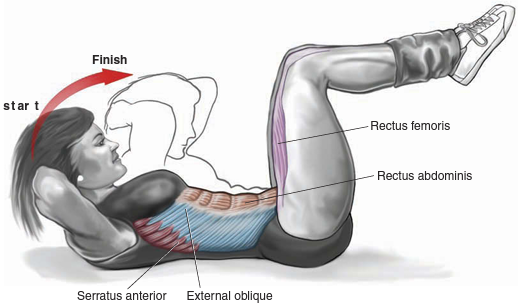 As you raise your legs up, lift your pelvis off the bench slightly to maximize contraction in the lower abdominals. Range of motion: To maximize muscle contraction on the way up, raise your knees as high as possible toward your chest. 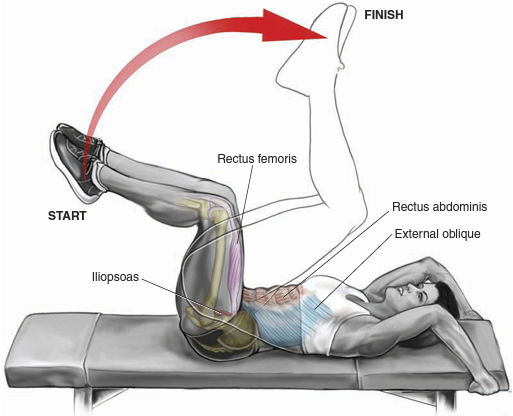 To keep tension on the abs, do not lower your legs all the way down or allow your feet to touch the f loor. Trajectory: The angle that the bench makes with the fl oor affects the degree of diffi culty. Titling the bench at a steeper angle makes the exercise harder. Resistance: Decrease the incline by lowering the bench to reduce resistance, or increase the incline by raising the bench to increase resistance. 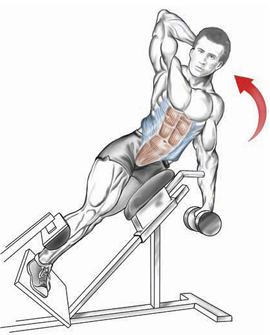 Incline Leg Raise With Weight This exercise can be performed holding a dumbbell between your feet for added resistance. 1. Hang from a chin-up bar using your hands, or place your elbows in a pair of ab slings (these attach to the bar to support your body weight); your legs hang down. 2. Lift both knees, together and slightly bent, toward your chest. 3. Slowly lower your legs back down to the start position without swinging. Hand position: Take a shoulder-width overhand grip on the chin-up bar and hang with your arms straight. Alternatively, use a pair of supportive upperarm sleeves, like the ab sling device. Body position: Your torso should hang vertical, perpendicular to the fl oor. Range of motion: Raise your knees as high as possible to maximize muscular effort. As you lower your legs down, keep your knees slightly bent to maintain tension on the abs. 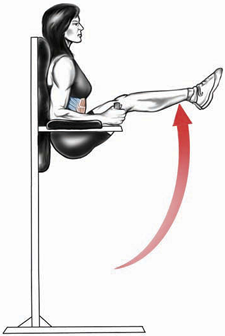 Trajectory: As you raise your legs up, lift your pelvis to maximize contraction in the lower abdominals. Resistance: The exercise is harder if you try to keep your legs straight. The more you bend your knees, the easier the exercise becomes. Vertical Leg Raise On this apparatus, your back is supported against a backrest and your elbows rest on pads. This version prevents the legs and torso from swinging. 1. Sit on the edge of a fl at bench, legs hanging down with knees slightly bent, and grip the bench behind you. 2. Raise your knees up toward your chest, keeping your legs together. 3. Lower your legs back down until your heels almost touch the fl oor. Hand position: Grasp the bench behind your hips for support. Foot position: Keep your feet together and knees slightly bent. Body position: Lean back slightly so that your torso makes a 45- to 60-degree angle with the bench. Range of motion: Raise your knees up until your thighs almost touch your abdomen. As you lower your legs down, stop before your heels make contact with the fl oor to keep tension on the muscles. Trajectory: Leaning your torso back allows you to increase the range of motion. Resistance: Hold a small dumbbell between your ankles to add resistance. 1. Lie on a fl at bench, position your feet so you have a 90-degree bend at your knees and hips, and grasp the bench behind your head for support. 2. Lift your pelvis off the bench until your feet point to the ceiling. 3. Lower your legs back to the start position. 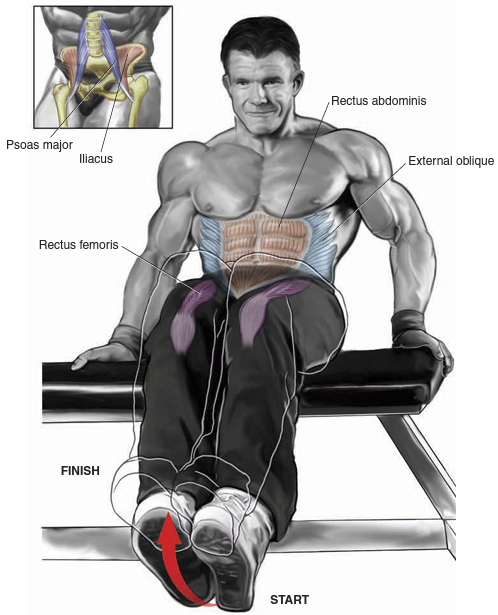 Secondary: Obliques, hip flexors (iliopsoas, rectus femoris). Hand position: Put your hands behind your head and grasp the bench for support. Foot position: In the start position, your thighs should be vertical and your lower legs parallel to the bench so that you have a 90-degree bend at your knees and hips. Keep your feet and legs together. Body position: Keep your upper torso in contact with the bench. Range of motion: Contract your lower abs to lift your pelvis up off the bench, raising your legs until your toes point to the ceiling. Hip Flexor Machine Hip fl exor machines allow you to perform a supine leg raise variation of the reverse crunch with resistance in the form of a strap across your lower thighs. 1. Sit on the decline bench, hook your feet under the pad, lean back, and position your hands behind your head. 2. As you sit up, twist your torso, directing your right elbow toward your left knee. 3. Lower back down to the start; during the next repetition direct your left elbow toward your right knee. Secondary: Serratus anterior, hip fl exors. Hand position: Position your hands behind your head. Foot position: Your feet must be secured under a roller pad or comparable support. Body position: Knees should be bent to reduce stress on the lower back. Range of motion: Your torso should be vertically upright in the top position, with one elbow almost touching the opposite knee. Lower your torso backward until almost parallel to the fl oor, about three-quarters of the way down. If you lean back too far, tension is released from the abdominal muscles and more stress is placed on the lower back. Trajectory: Tilting the bench at a steeper angle makes the exercise harder. Resistance: Increase resistance by tilting the bench at a steeper incline or holding a small weight plate behind your head. Sit upright on the edge of a fl at bench while holding a broomstick behind your neck. Twist your upper body from side to side. When you twist to the right, feel the right oblique muscles contract, and vice versa. 1. Lie on your left side, knees bent together, right hand behind your head. 2. 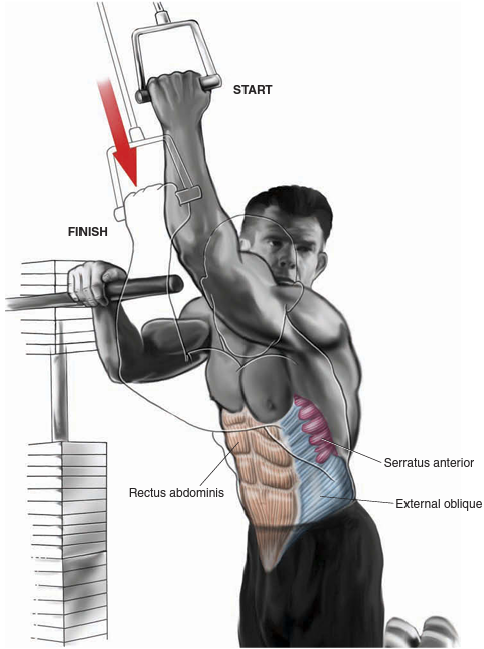 Slowly lift your upper body by contracting your right-side obliques. 3. Lower your torso back down. Hand position: Place your upper-side hand behind your head and rest the other hand over your knee for balance. Do not pull your neck up with your hand. Foot position: Position your feet so that you have almost a 90-degree bend at your knees and hips. Keep your legs together. Body position: Lie on your left side to work the right obliques, and then switch to lie on your right side to work the left obliques. Perform this exercise on a cushioned exercise mat placed on the fl oor. Range of motion: Your torso crunches 30 to 45 degrees upward from the f l oor. 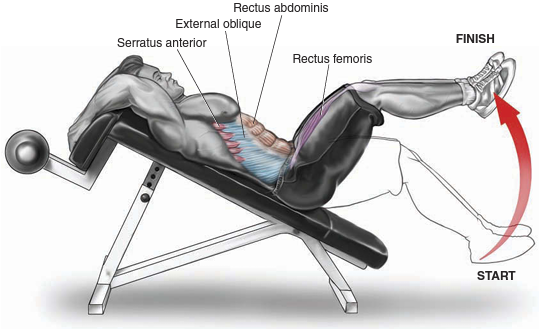 Incline Oblique Crunch Use an incline abdominal chair. Secure your feet on the support platform and lean back sideways into the seat, resting on one buttock only. Place your uppermost hand behind your head, and crunch your torso upward. 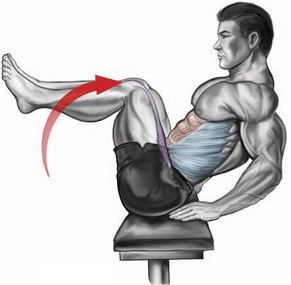 Machine oblique crunch: Perform this while sitting obliquely in the seat of a crunch machine, working one side at a time. 1. Grab a D-handle attached to the high pulley of a cable machine. 2. Crunch downward, directing your elbow toward the opposite knee. 3. Slowly return to the start position. Hand position: Your hand should grasp the handle above or alongside your head. Foot position: You may perform this exercise while standing, kneeling, or sitting. Body position: You can perform this exercise while facing toward or away from the weight stack, depending on personal preference. Stand sideways to the weight stack, grab the D-handle attached to a high pulley with your nearside hand, and crunch downward, directing your elbow to the hip. Rope oblique crunch: Holding the rope attachment with both hands (as described: Rope Crunch), crunch with a twist to one side and then the other to work the obliques. The motion is similar to that used during twisting sit-ups. 1. Stand upright while holding a dumbbell in your left hand and place your right hand behind your head. 2. 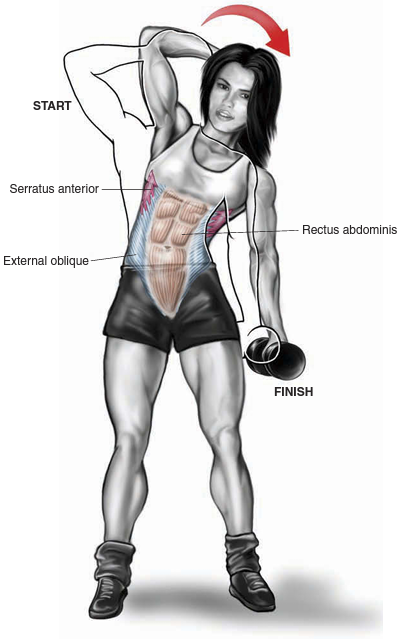 Bend your torso to the left side, lowering the dumbbell toward your knee. 3. 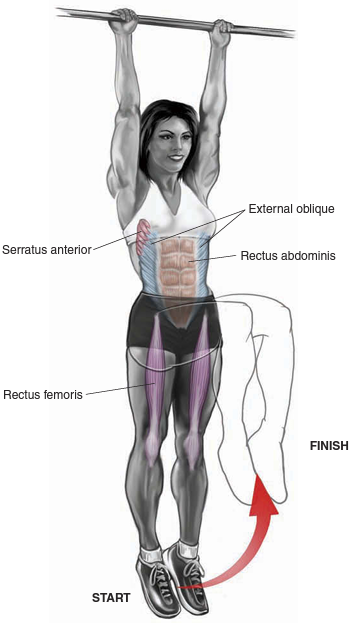 Straighten your torso upright, contracting the right oblique muscles. Hand position: Hold a dumbbell at arm’s length by your side in one hand, and place the other hand behind your head. Foot position: Stand with your feet hip-width apart. 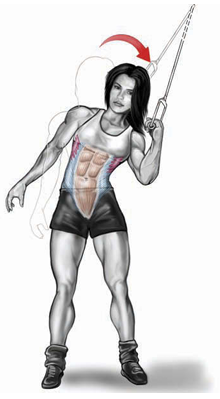 Body position: When you bend to the right side, you work the left obliques, and vice versa. Range of motion: Your torso should bend approximately 45 degrees or until the dumbbell becomes level with your knee. Trajectory: Your torso should move directly sideways without leaning to the front or back. Resistance: Avoid using a heavy dumbbell for this exercise. Large overdeveloped oblique muscles will make your waist appear bulky. Use a D-handle attached to a low pulley and stand side-on to the weight stack. 1. 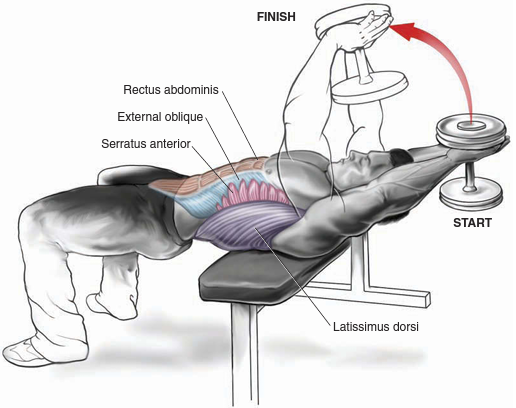 Lie with your upper back resting across a fl at bench; hold a dumbbell straight above your chest. 2. Lower the dumbbell down and backward until it reaches bench level, inhaling deeply and stretching your rib cage. 3. Pull the weight back up to the vertical position, exhaling as you do so. Primary: Serratus anterior, intercostals, latissimus dorsi. Grip: Hold the dumbbell by placing your palms against the inside of the weight plate at one end, making a diamond shape around the bar with your thumbs and index fi ngers. Body position: Your torso should remain still and parallel to the fl oor, with your upper back resting on the bench and your feet fi rm on the fl oor for stability. 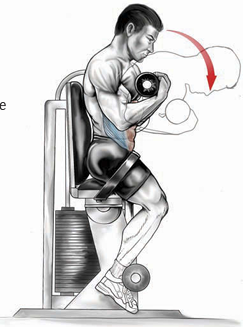 Range of motion: The dumbbell moves through an arc of about 90 degrees. Aim for a full stretch in your rib cage as the weight is lowered. Resistance: Do not use a heavy weight, because the shoulder joint is vulnerable to injury during this exercise. This is not an exercise for the oblique muscles. 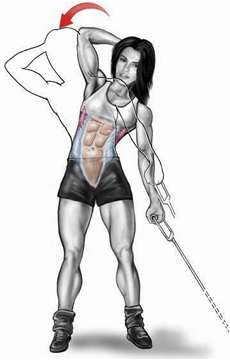 It is included in this section because the serratus anterior is worked during most oblique exercises. This is the same exercise using a barbell. Machine pullover is another variation.